G Force 2018 was definitely our most stressful G-force to date; As the weekend of the 3rd March drew closer, it was clear that there was no possibility of the comp taking place as planned, with the 'Beast from the East' burying much of the country under several feet of snow! G-Force 2018 instead kicked off on Saturday 11th March, with 200+ competitors vying for a top-20 spot which would take them into semi-finals. As opposed to previous years, where competitors were split into groups for qualifications, this year, the qualification round was open from the morning til mid-afternoon, and competitors were allowed 3.5 hours from whenever they started to complete as much of the 30-boulder circuit as possible. It made for a more relaxed round, with less queues, both on the boulders and in the cafe! Competition was fierce in both the male and female categories, with the difference of a mere point, sometimes, between those who qualified for semi-finals, and those who didn’t. Victoria Watterson came in first in her category, with a whopping 236 points, followed by Sheila Nolan, with 208, and Sarah Hoare, with 204. In the men’s category, the qualification round ended with a three-way tie between Daragh O’Connor, David Fitzgerald, and Michael O’Neill, who flashed all 30 problems for a massive 300 points each. On Sunday morning, the top 20 competitors in each category were put into isolation, and called out, two at a time, to attempt four gruelling boulders which they had never seen before. Each competitor had only five minutes to try and work out the problem, and then had five minutes’ rest before trying the next. Problem 1 was a tricky one for the men, on dual-texture holds with a slippery top, seeing only two sends: a flash from Ciaran Scanlon, and an ascent on the second attempt by David Fitzgerald. The women's first problem, with some slopey volumes, also proved tricky, seeing only seven tops, including flashes by Sheila Nolan, Sarah Hoare, Victoria Watterson, Trish Fox, and Gravity’s own Claire Comiskey. Problem 2 proved even harder. The women's problem featured an exciting jump followed by a balancey finish, and saw only five tops, whereas in the men’s category, Problem 2 featured a shoulder press on some Flatholds, and saw only four ascents, two of them flashes from Ciaran Scanlon, and Michael O’Neill. Problem 3 saw no tops in either category. 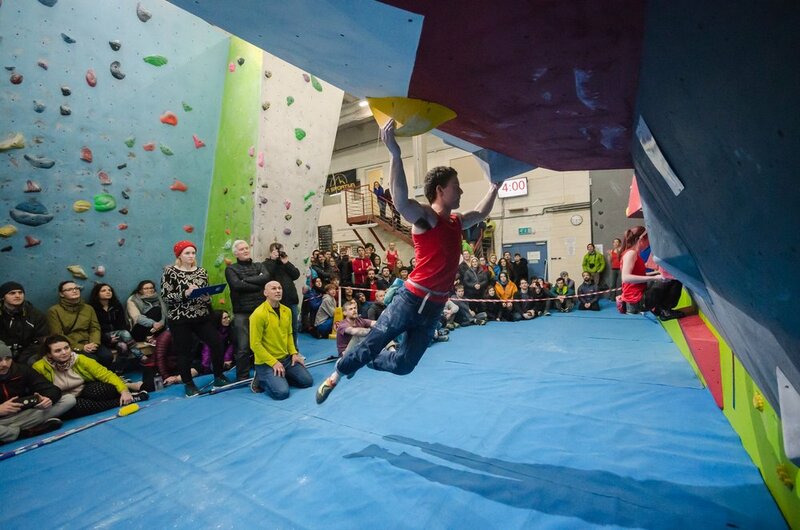 Only four male competitors even managed to secure the bonus hold on the problem, which started with a dyno, and finished on some slopey volumes, while only two female competitors managed to get the bonus on a "guns out" compression-style climb. Problem 4 was a little easier for everyone, seeing eight tops in the male category (with a notable number of attempts by Luke Hackett, who topped the "dyno-press-jump-thing-followed-by-some-mingin'-crimps" problem on his tenth attempt—fair play, Luke!). Fifteen female competitors made the top of Problem 4, which featured either a bridge or a mantle on the slab, with several competitors flashing the route. All in all, semi-finals saw Sheila Nolan and Sarah Hoare in first place going into finals with three flashes each (seating decided by count-back), and Victoria Watterson close behind with three tops in four attempts. In the male category, semi-finals left David Fitzgerald in first place with three tops in five attempts, Ciaran Scanlon hot on his heels with three tops in six attempts, and Michael O’Neill in third place, with two tops in seven attempts. After a hefty serving of delicious barbecue, (thanks Natasha & Marek!) a formidable crowd gathered for the finals late on Sunday afternoon, and the competitors viewed their final problems, while Ciaran Mulhall and Ryan Mollan kept the crowd entertained with their hilarious commentary, and the DJ played some absolutely bangin’ tunes. M1 was a perilous stem between some disappointing dual-texture footholds and the competition wall slab, and saw only three tops, though they were all flashes. F1 was a strange and tense journey smearing up volumes, with a committing rock-over to the finish. It nevertheless saw six glorious tops, four of them flashes. M2 featured a sideways jump around a volume that proved extremely difficult to latch and a balancey finish. It saw only three tops, two of them flashes. F2 was a long and sustained problem, featuring some dynamic monkey-like moves, and an incredible sideways mantle/drop-knee-press. Amazingly, it saw three tops, all of them flashes. M3 was a difficult jump-to-a-compression on some very un-promising-looking volumes, followed by a bit of burl and some high feet to the finish. Though everyone managed to secure the bonus, it saw only five tops, four of those flashes. F3 was a strange series of volumes that needed grappling, leading to an extremely tenuous rock-over with an enormous slopey handhold and an extremely dubious foothold to finish. This problem, too, saw five tops, three of which were flashes. M4 had a dynamic jump to a slopey compression under the new competition wall roof, and then a sustained and contortion-heavy finish. This problem saw only two tops: a proud top on the third ascent by Michael O'Neill and an unbelievable flash by Daragh O'Connor to give him 4 tops in 4 and top spot on the podium. F4 was a burly and tiring series of tick-tacky moves on undercuts, followed by a rock-over on an extremely small and high foot-hold into the finishing moves. Victoria Watterson made the only ascent of this problem, on her third attempt, to riotous applause from the spectators. After this spectacular finish to the competition, there was the usual hilarity of the prize-giving, and much good-spirited ribbing amongst the contestants as they attempted to mount the make-shift podium, consisting of some volumes on the competition wall slab; seasoned G force winners know to keep their climbing shoes on for this one! Thank you so much to the staff of Gravity for making this competition run so smoothly, to the route-setters Rob Hunter, Juan O’Raw, Angela Carlin & Terry O’Connor for some original and spectacular problems, to the volunteers who graciously judged the semis and finals, under the watchful eye of chief judge Damien O’Sullivan, and to our sponsors: BattleOats, Moon, La Sportiva, Fiveten, Metolius. Lastly, thank you to all the competitors. It's because of you that G-Force continues to be a smashing success every year. Keep training hard, and we'll see you next year!